a sense of meaningful accomplishment and contribution that truly feels like a gift to ourself and to the world…because we know that living is giving and change making belongs to all of us. a deeper connection to who we are in this world, what our values are, how we want to show up, and a clear roadmap for continued growth…because we know this precious life of ours is a perennial journey and who we are being always, always precedes what we do. We are the Devotees of depth. a confidence that resides from within enabling us to lean into the messy as much as the marvelous. There is a feeling of sacred celebration for this life that leads us to act without attachment (we are more curious than afraid), to see our goals not as a place to arrive at, but rather, a place to come from, and to do the work (even when it’s hard)….because we trust, no matter what, we will be okay. We are the Changemakers courageous enough to bring our full self to the world. If this resonate with your soul, then sisters, brothers….let’s lean in, together. When we don’t have support and direction, we feel lost. When we don’t have support and direction, we feel lost…but what’s worse is we close our light off from the world. We may create something nice, something safe, something ‘good enough’ - but our potential is brilliance. It is wild and free and so uniquely ours. It doesn’t matter what our story was…it only matters what story we are willing to write, now. 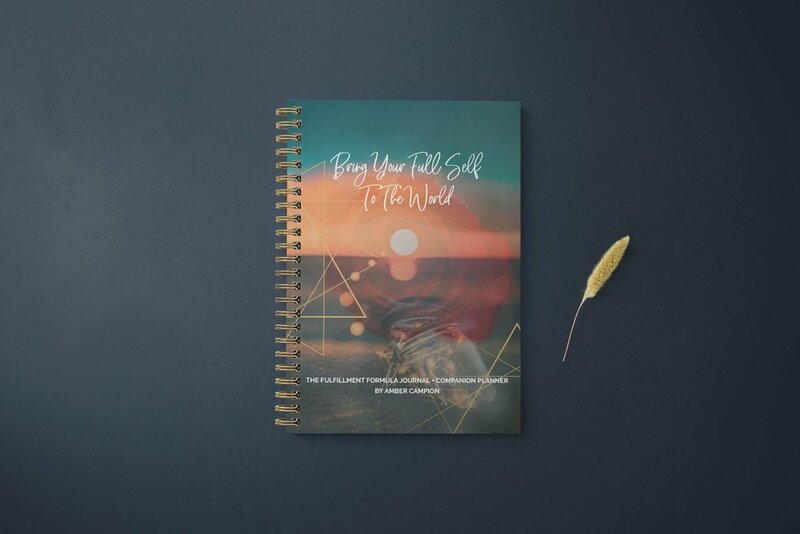 Last week I released my new book: The Fulfillment Formula Journal + Companion Planner. I’m so proud of it. It was a lot of work, and naturally I’m a little scared what people will think of it, but more so, I’m curious! This journal guides you to define, design, and develop the one thing that matters most when it comes to creating life on your own terms…you. It guides you to write the truest story of your life and it teaches you how to see goal setting as a spiritual practice, one that develops your character, rather than a practice that competes and depletes. I am launching this book alongside a 4 week virtual experience that is like no other. The Changemakers Collective guides you through the book, includes coaching, soul circles, inspiring guest interviews, and some sweet surprises to delight you. Curating an experience was essential to me when I created this book, because I know how important community is. I know that sitting alone in a room going through the processes would be insightful and fun, but to turn this into an experience, amplifying the power in those pages, ensuring you do the work, meeting other like-minded souls…would alchemize this into something extremely powerful. I want see 100 people enter the new year with a renewed sense of self that feels alive and free. That feels capable and full of potential. That feels the next year is not something to ‘get through’ but rather, something to create with depth, meaning, and wholehearted courage. So I have made this an easy yes for everyone, for a limited time the investment is only $97 which includes the experience, the book, as well as shipping in the United States (international is a little more, but not much). If you can’t make the sessions live or you want to review sessions again, no problem…you’ll have access to a virtual ‘clubhouse’ where all replays, interviews, and surprises will be stored. There are also 3 sessions in 2019 (quarterly reviews) so we can re-connect and see what feels aligned, what’s working, and what’s not working. Plus you will have access to a private Facebook page where I, along with the other members, will be there for support and connection throughout the year. I’m only printing 100 books this year and I do believe they’ll go fast (20 are already accounted for). Please don’t hesitate for any reason at all if this resonates with you. Even if you’ve done end of the year designing and planning before, this experience is going to be one of kind. The Fulfillment Formula in of itself is my creation, plus I don’t know any others who are also including coaching (and especially not at this investment). If you got even ONE breakthrough, met ONE new incredible friend, received ONE life changing insight…would that be worth $97 to you? My heart is fully in this, because the world needs us to bring ourself to it…our full self. Let’s do this friends! And let’s do it…with soul. To planning with purpose, presence, and peace of mind…together.